What is the PYRO-ENERGEN Electrostatic Therapy Machine? PYRO-ENERGEN produces and utilizes powerful negatively-charged static electricity in a way that can eradicate the root cause of various diseases such as HIV/AIDS, cancer, herpes, hepatitis, and influenza. Negatively-charged static electricity exists naturally in our atmosphere. It is essential to living things and is beneficial to repel the world's maladies. It is a 100% naturally occurring energy so it does not yield harmful side effects. Static electricity is therefore one of the best elements for the treatment of diseases. On What Diseases Will PYRO-ENERGEN Work? Note on Cancer: We have good records of cancer recovery from stage 0, 1, and 2, when applying the PYRO-ENERGEN electrostatic therapy in a matter of one week to one month time. However, it might be difficult to expect 100% recovery from stage 3 cancer. Chance of recovery starts to diminish at stage 3 cancer cases as the cancer cells start to metastasize and spread to other organs. For stage 4 cancer, the chance of recovery is very slim (though not impossible), and the PYRO-ENERGEN may only help ease the pain and increase the survival rate or life expectancy of the patient. If your cancer is stage 0 up to the beginning of stage 3, then expect recovery to be amazingly fast and satisfactory. We know that prevention is better than cure. 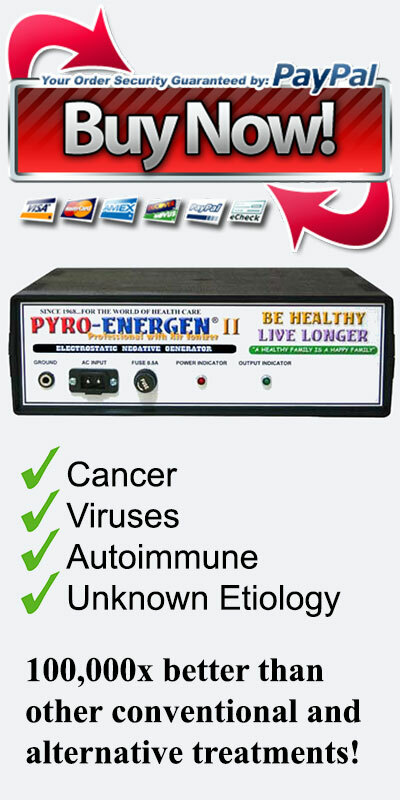 When you are healthy, the use of PYRO-ENERGEN can prevent you from contracting cancer and viral diseases, making the machine a must-have investment for the family. The PYRO-ENERGEN may fall under the category of "alternative medicine". It works against cancer cases so in essence it is also a form of "alternative cancer treatment". Note that we only call it "alternative" to differentiate it from conventional treatments like drugs, chemotherapy, radiation, surgery, etc. Decades of research and anecdotal evidence shows that PYRO-ENERGEN is far more superior and effective than orthodox medical treatments such as chemotherapy and radiation therapy when it comes to treating cancer, viral diseases, and diseases of unknown cause. Not only that, it works WITHOUT the harmful side effects and yields the best and fastest healing results! Don't forget the fact that alternative medicine is now becoming mainstream, with more and more people leaning to natural methods and herbal medicines, in lieu of surgery, pharmaceuticals, and orthodox treatments, which is a good thing. The PYRO-ENERGEN is the only therapy machine in the world so far that is closest to natural methods. We are fully aware of the existence of AC high voltage therapy machines. They are being marketed under several different names: "electrostatic field therapy", "high-voltage electric field therapy", "static electricity therapy", "high potential therapy", etc. Most of these machines have the numbers "9000" affixed on their brand names. But they're all entirely the same thing—they operate by producing high voltage alternating current (AC) with output voltage that varies from 3000-9000 volts. Although it looks like these devices operate similarly to the PYRO-ENERGEN machine, they are completely different. The PYRO-ENERGEN machine is way ahead in terms of healing technology, efficacy, and safety, compared to machines that utilize AC voltage. 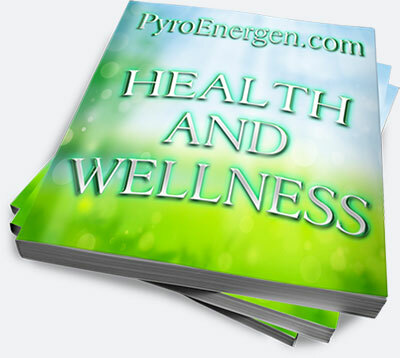 Read about PYRO-ENERGEN in this website, use it, and experience for yourself what it means to be healthy and disease-free. It is possible! It is really a breakthrough in electrostatic therapy. Why bother with other costly treatments of the medical community that failed to heal you? The method of PYRO-ENERGEN is simple, it works, and it's cheap. You can do it at home while watching TV, reading books, and listening to a radio. It doesn't require a rocket scientist to figure out how to do it. Isn't that the way it should be?